Every summer I develop blueberry fever for a short period of time. Last year it was Blueberry Thyme Shrub and Blueberry Peach Preserves (helped out with some deeply buried peach puree from my freezer). Along with these there always are blueberries made into quick compotes to top pancakes, muddled into cocktails (whiskey and gin are good for you if there is fruit involved), thrown into cereal and yogurt; but never made into muffins. I blame my distaste of blueberries for many years on one too many bad and cheap blueberry muffin, always too sweet with a dark musky aftertaste of dried blueberries – or hopefully dried blueberries, rather than berry impostors. If there is one common theme in al my berry-centered recipes, it is the use of thyme, either fresh or dried, as in the Summer Fruit Preserves. The light floral flavor and scent of thyme pairs as well with the acidic sweetness of berries as it does with savory meat dishes, perhaps better. 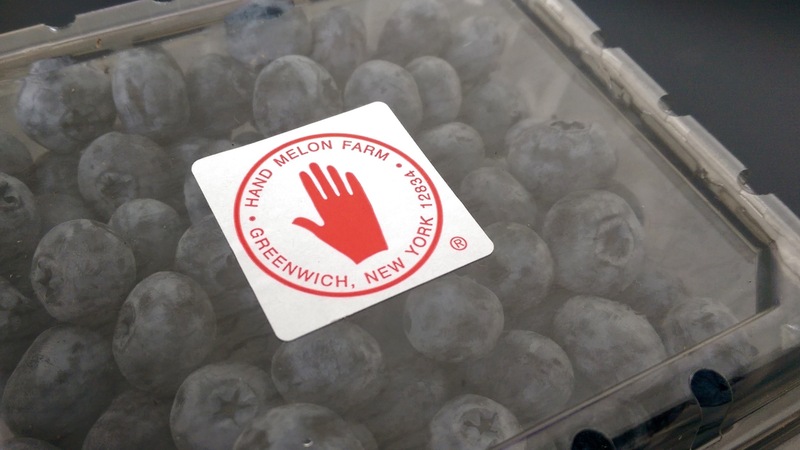 Handpicked blueberries from Hand Melon Farm in Greenwich County, New York. 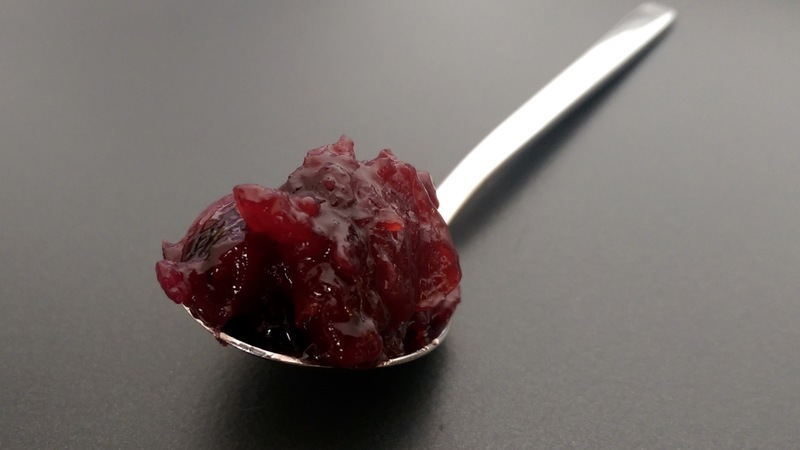 This particular recipe takes advantage of the slight tartness of blueberries by adding apricots and a small amount of apple cider vinegar, resulting in a thickly textured preserve. Place the blueberries and sugar in a five quart saucepan. With a potato masher or the back of a wood spoon, gently mash them together. Add the remaining ingredients, stir to combine, and place over medium heat. 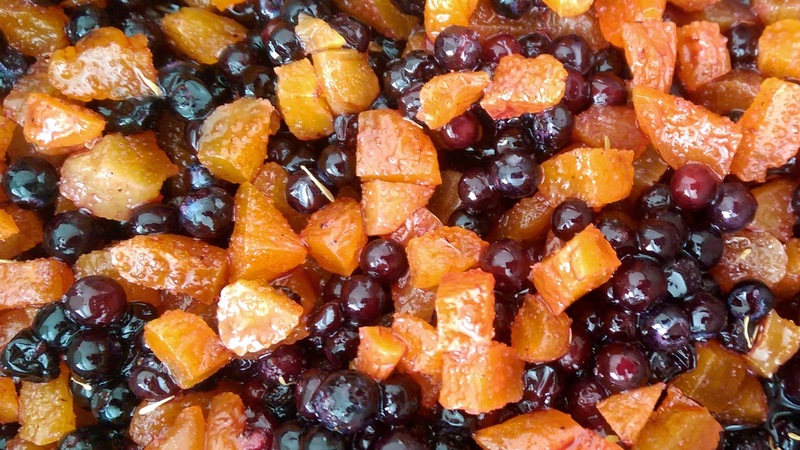 Lightly mashed blueberries with apricots. Bring to a gentle boil and reduce to a simmer. Skim the surface to remove any scum. Cook at a gentle simmer until the liquid has thickened enough to coat the back of a clean spoon, or to the desired level of thickness. Jewel toned, the finished preserves. Pack into five sterilized and hot 8 ounce jelly jars. Process in a hot water bath for 12 minutes, adjusting for altitude as necessary. For canning tips, refer to the Ball Jar Company’s ‘Getting Started‘ guide. Use the preserves paired with a funky goat cheese, as the centerpiece of a pork glaze, or simply on buttered toast.